If you are anything like me, you have your smart phone with you at all times. With Winter comes cold weather. Try using your smart phone with your gloves on. It’s an exercise in frustration. 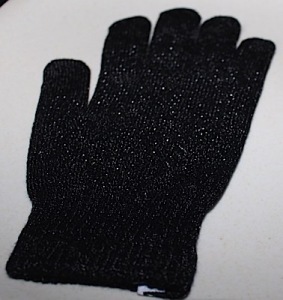 You take your gloves off just long enough to respond to that text or email and then quickly put them back on before you end up with frost bite. 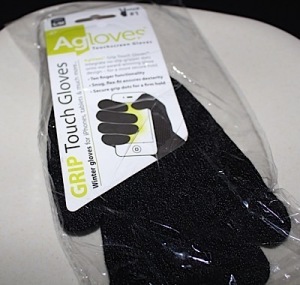 I had heard of gloves that you can wear and still use your smart phone or tablet. 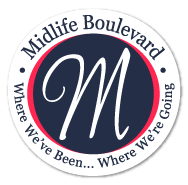 There are many names for them depending on the vendor that is selling them. I wanted to know if they really work so I purchased a pair. The pair I bought had great reviews on Amazon. That’s one of my criteria for making any purchase – great reviews. 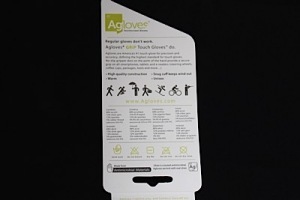 Agloves arrive in minimalist packaging, as you can see from the photo above. The gloves actually work! They have little rubber dots all over the fingers and palm to help you keep hold of your tech. The tips of the fingers and thumb are kept clear so they can work on your tech screens. I used the fingers and the thumb and was pleasantly surprised. It worked as if I had no glove on at all. They are Unisex and come in sm/med and med/large sizes. I got the sm/med. When I purchase gloves I typically have to buy from the children’s section because my hands are so small. No really. It’s true! So if you want to use your tech without the fear of frost bite you can count on these gloves. So tell me, have you used tech friendly gloves? What kind and how did they work out for you? I've been thinking about getting a pair of Gordini StashLite gloves for this very purpose since they'd work best for jogging and hiking. Thankfully, I don't wear glove very often in South Carolina! But I did tweet this so my friends in colder climates can read your review:) It is such a common complaint that this is a good find! Hi Cheryl, what a great invention for those of you that live in colder climates. Won't have much use for them in California, but sure there are plenty of people glued to their mobile devices that will love this.